Badsha Stores is a one stop shop for all types of Sarees keeping you in tune with traditions as well as latest trends. 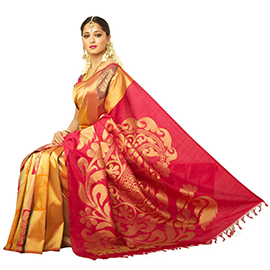 Find yourself a 100% pure silk Saree from the Mysore region with class and elegance. If you feel like getting a light feel with a saree pick from our exquisite collections of Chiffons, Crepes and Georgette Sarees , that feel very elegant but at the same time light and easy to wear. If you are looking for regional choice we have a very carefully selected range of Kanjivarams, Dharmavarams , Cotton and Cotton Blends Sarees , Tussars and Khadi from the South Indian. We also have an nice collection of embellished sarees that would be ideal for the north Indian wedding you plan to go to. Badsha stores was established in Mysore in the year 1965. We bring you a beautiful blend of tradition and modernity, through a variety of silks sarees, tunics, salwar kameez and a range of brocade, linen and cotton fabrics to create the look you want. © 2012 BADSHA STORES. All Rights Reserved.